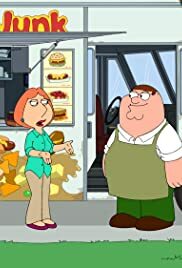 When Lois forces him to eat healthy food, Peter opens up his own food truck with fattening foods; Meg joins a roller derby team. Peter Griffin: Oh, hey Lois. I guess you must be happy. Lois Griffin: Yeah, it's every girl's dream to have her husband hoisted out of a food truck in a horse harness. OK we have Peter hating eating Lois's new healthy meals so he decides to open up his own food truck with unhealthy foods, and with Meg joining a roller blade team, that reminded me of American Dad where Steve and Hailey joined a roller blade team. Also, I like the joke where Chris is getting pictures of the girls bending down for excercises.